Please see below, a report from Sammy in Y6 who was one of our lucky winners in the library competition to design a book cover and as such, had a wonderful day out over half term, meeting some famous authors. Well done Sammy and thank you for the great report. I'm Sammy in Yr. 6. Before half-term there was a competition at school to design a new book cover for books by Chris Riddell, Jacqueline Wilson and Julia Donaldson. I decided to do “The Highway Rat” by Julia Donaldson and I was lucky enough to be one of the winners. The prize was two tickets to meet one of the authors at the Birmingham Conservatoire. The tickets were to watch a talk and to get one of their books signed. My tickets were for Chris Riddell. I had never actually read one of his books so I read “Goth Girl and the Wuthering Fright” before we went and I really enjoyed it. 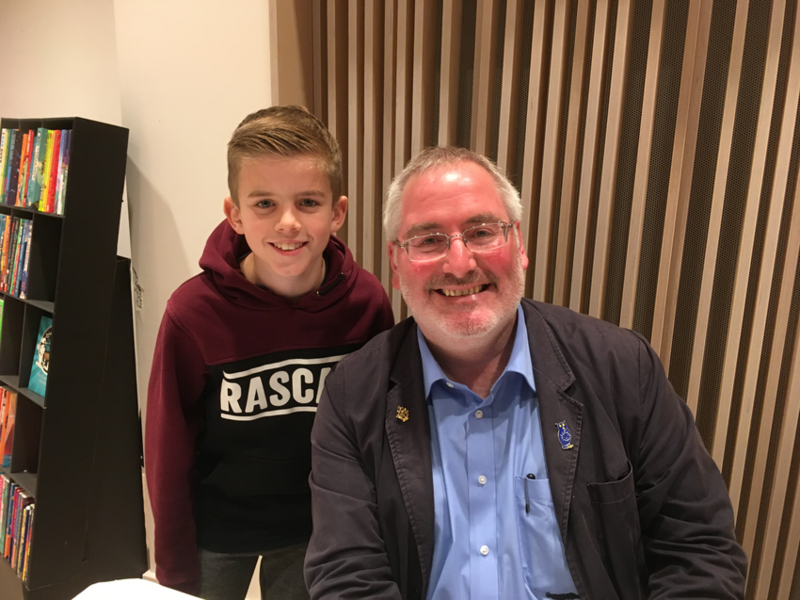 I went to meet Chris Riddell on Saturday 3rd November at the Conservatoire. I watched him talk about his passion for writing and love of art. His talk was about his book “Goth Girl and the Sinister Symphony” and each time he mentioned a pretend composer (for example Haydn Seek) a string quartet played a piece of music by the real composer. While this was happening, he illustrated some of the characters from his book. After the show, I got my book signed by him and I had chat with him. He was very funny too.